A recent visit by this MGM staff writer to Canada’s new golf hot spot provided blue lobster tales, runaway push carts and under-the-lights putting. It’s 6:10 a.m. at an island outpost in the North Atlantic. Overcast skies shroud the sunrise of this hilly, rural fishing community. But that does little to darken the excitement of a new day. Breakfast is served. For a table of one, six half slices of Bananas Fosters French Toast is the choice. Down the way, a larger group – say two foursomes – checks out the buffet area and partakes in some much-needed local coffee. And at a nearby table, an older couple takes a longer look at the menu because the Fisherman’s Benedict, Forager’s Hash and Eastern Omelet all seem like hearty ways to start. While others may still be in bed, all kinds of weary golfers filter into the second floor restaurant wing looking for some morning fuel. Some may have played 36 holes the day before or some might be visiting to tee it up for the first time. Either way, there is a palpable excitement underneath the exterior of bloodshot eyes and untied golf shoes. Setting the horizon to the west is the Gulf of St. Lawrence, just a long par-5 away. In the foreground, bumps and bunkers – littered with maintenance workers – form one of the truest links landscapes in North America. The 18th green and fairway are just below, only a lag putt away. And the cave-like shack off the putting green and first tee in the distance is where the starter is getting ready for another busy day. Among his supplies is a jar of chocolate-chip cookies. With floor-to-ceiling windows extending the length of the restaurant, there is little wonder as to why they call this eating spot “Panorama.” Everything is right there to soak up. What a sense of place it evokes. Is there any better breakfast viewing in all of golf? The original course at Cabot Links (2011, Rod Whitman) is compressed between the main town road and the beach on the west coast of beautiful Cape Breton Island, Nova Scotia. The community of Inverness was an economically depressed area – the site of a former coal mine – until Cabot co-owners Ben Cowan-Dewar, a Canadian, and Mike Keiser, of Bandon Dunes fame, helped to revive it with a coastal links layout and modern architecture that seems to work with its surroundings. 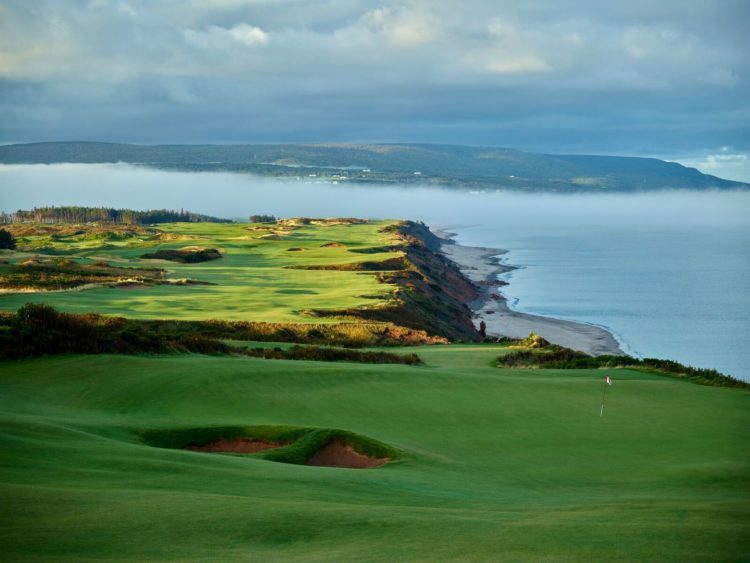 With the opening of a second course, Cabot Cliffs (2016, Bill Coore and Ben Crenshaw), the resort at Cabot has become a North American bucket-list spot for golfers. Joel remembers times when his family used to camp, not far from the beach, at a spot which is now part of the back of the range at the Cliffs course just a five-minute shuttle ride down the road from the main entrance at Cabot. Cape Breton has so many memorable spots – from the hiking trails at the National Park in the Highlands to ones like Inverness Beach along the shoreline of the aforementioned Gulf of St. Lawrence. Three holes on the Links run directly parallel to that beach which can be accessed by a boardwalk. The original course at Cabot has wide fairways, at least three that are shared by holes, and plays as a truer links. Perhaps the most representative hole on the course, however, is No. 6. On the property’s charming southern-most spot, the fairway of the par-4 dog legs left around a harbor (MacIssac’s Pond) where fish shanties and lobster boats make their home. It feels like true maritime Canada, albeit on a small scale. While the Links course features 15th Century Italian explorer John Cabot’s ship, the Matthew, on its logo, the partnering Cliffs course uses a rare sea catch as its logo. The blue lobster is said to be one in two million though several have reportedly been caught in the North Atlantic including off the coast of Nova Scotia. The Cliffs senior golf professional, Joe Robinson, even has a picture of one on a boardwalk. According to Cabot’s web site, a blue lobster was caught off the shore just a week before the Cliffs opened for preview play in 2016. Nobody at Cabot knows more about golf on Cape Breton than Robinson who worked for decades at famed Highland Links, just over a two-hour drive to the northeast. Robinson is in his late 60s and back issues often prevent him from playing, but the rare occasion to take an 18-hole walk with him is a treasure. Not only will he point out the nuances and target lines at Cabot, but on a humid, sunny day in August he was quick to point out where the helipad just off the Links is located when a chopper flies by. And where Cowan-Dewar keeps a residence on the hillside along the coast where he can see parts of both courses. He also said PGA Tour star Adam Scott visited this past summer and that the Chicago-based Keiser visits several times a golf season. On a more recent visit, according to Robinson, Keiser arrived to find, blissfully, that no rooms were available. Keiser had always been inspired by trips to Scotland and links golf and with Cowan-Dewar he found a desired spot on Canada’s eastern seaboard. Nova Scotia is Latin for “New Scotland” and its provincial flag bears a striking resemblance to its European namesake. There is a Scottish heritage that permeates the region from familiar town names – i.e. “Inverness” – to the Glenora Distillery, which offers a history lesson and whisky tours just five miles down the road from Cabot. Sometimes whisky, or a hot bath, after a long day of walking the course is just what the doctor ordered. Maybe the best part of Cabot’s lodging is the floor-to-ceiling windows, like the Panorama, which offer an undisturbed view of the gradually descending Links course to the Gulf. Close luxurious seconds are the deep bathtub and huge shower stall. Each guest is greeted with a famous golf quote on their room’s door. There are quips from Palmer, Snead, Rodriguez, Trevino and even comedian Bob Hope. The room at 6.64 offers the sub-title above from Lord Robertson, a Scot fittingly, who must have known what was in store. On the second day of Midwest Golfing Magazine’s visit, sustained winds of 30-35 mph (with a peak gust of 43) are blowing. Golfers are trying to stay upright, let alone make contact with a little white ball. On the Cliffs range, wedge shots are being blown back to the point where they can almost be caught. On the course, golf bags are being blown over and full water bottles are rolling away. There is even a sighting of an unattended push cart being blown uphill. And legitimate discussions also take place about using a putter to “tee off” on two par-3s – No. 6, playing downwind through a narrow chute of dunes, and No. 9, playing into the wind at about 90 yards slightly downhill. The fescue greens are running at about eight on the Stimpmeter yet balls that are re-marked are sometimes being blown away. If this was an Open Championship, the R&A would suspend play. But these golfers press on and take extra wide stances just to keep their balance. Caddy Ardell says there are windy days at Cabot but this is the worst he has experienced all season. Golf ball contributions aside, there is a reasonable chance for a great finish on calmer days. The par-3 No. 16, over part of deep cove, allows for shots hit to the left to be kicked onto the green. The hidden green and greenside bunker at No. 17, a par-4, can be reached with a driver by all levels of golfers who are brave enough to take the proper line over the cliff to a raised fairway. From there, the hole tumbles downhill where even a putter is an option from 100 yards and in. And No. 18 is a par-5 that reminds many of Bandon Dunes along the Oregon coast. After a knee-knocker tee shot, it opens up to the chance of making a birdie depending on hole location. The green is just 14 yards wide but 53 yards long. Behind No. 18 green is a large expanse of flat land where the starter’s podium makes its home and couches reside for golfers to rest their feet, add up their scorecard, or just take in the views of the Gulf. And a sunset, if lucky. Overall, the Cliffs is more dramatic than the Links. Coore and Crenshaw did a marvelous job of using what a much different tract of land offered them. The par-4 second is bold and incorporates natural features. So, too, does the short par-4 fifth which heads back toward the dunes and ocean. It is a cape-hole design that plays to a raised fairway and then back down again to a large green. The Cliffs also has forced carries (No. 3, No. 7 and No. 10), a par-3 with two green sites (No. 4), a good mix of uphill and downhill holes and probably the toughest par-3 at Cabot. Hole No. 12 is 200 yards from the middle tees with a large chipping area to the left that drops off like No. 3 at Augusta National. The overall bunker design is varied as well, no more than at No. 2 and at No. 14 where a rock formation helps front the par-3 raised green. Six par-3s, six par-4s and six par-5s all add up to a par 72. Golf, or a version of it, is still going into the night at Cabot. It’s past 10 p.m. local time and the patio deck extending from the Panorama bar and restaurant is the center of activity. 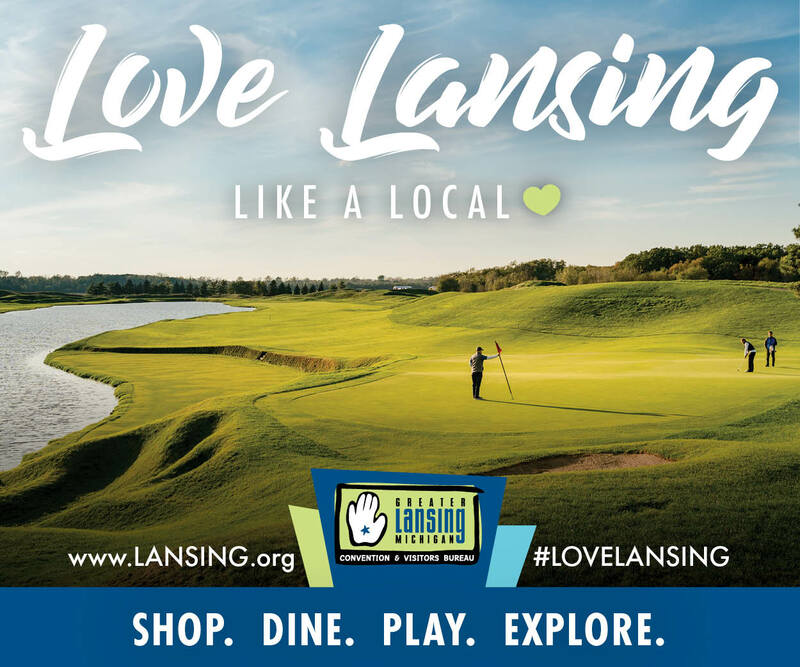 Shuttles with golfers and clubs are still arriving at the nearby bag drop and those partaking in a beverage or two on the patio are re-hashing rounds played and those to come. The area is well lit as is the 18th green at the Links course, which is snug to the wall-to-wall windows of the indoor Cabot Bar. Putting contests are being held and those less serious about golf are even participating. One lady is dressed in her pajama bottoms and a t-shirt and is holding a glass of wine. Another man with an untucked golf shirt has a pint of beer and is offering advice. Moans and cheers fill the damp night air with each putt. One can only wonder what the indoor crowd must be thinking watching this all happen. But back to the outdoor patio for a moment. From an acute observer’s perch, there is a sense that no can get enough of Cabot. Just one more night. One more round. One more stop at the beach. One more breakfast. These are moments to remember. Cue the bagpiper. A story on Cabot Links will also be featured in our 2018 Golf Show Issue magazine edition. For more information about Cabot, visit www.cabotlinks.com. For Cape Breton Island, visit www.cbisland.com.